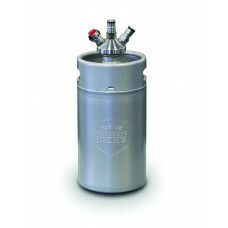 10L Keg – the biggest of our mini-kegs, stacks well with our 5L Kegs. Also, great for those experimental brews. It’s the perfect size for the ChinChiller kegerators! Not to mention the time you will save on not having to clean, sterilise and fill 10L worth of bottles (30 stubbies!!!). All our kegs are quick and easy to clean, and should last you a life time! 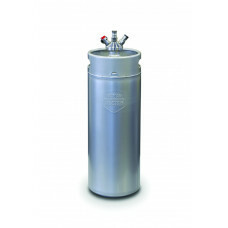 All our kegs are made from 304 high grade stainless steel, which have been pressure and quality tested. The 2L and 4L are stackable, likewise for the 5L and 10L, a great space saving feature! This is a great solution to eliminate the need to use plastic or glass bottles– hell we want to see you all going plastic free! Handy Tip – remember to put your empty, clean keg in the fridge for 30 minutes before filling – cold beer into warm keg = froth. The picnic tap option allows you to dispense directly from a mini keg using 16g CO2 canisters through a standard picnic tap attached to a short length of hose. This includes all of the components required to do this, with optional CO2 canisters - you just need to provide the beer. 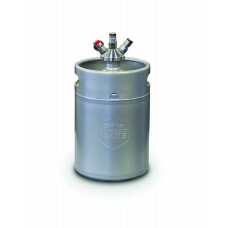 2L Kegs – it’s cute, easy to clean and it also holds about 4 pints of beer! We love it as it fits perfectly into the fridge and takes less space than a 6 pack. A great vessel to take along to BBQ’s or a mate’s place for a couple of quiets. 5L Kegs – Well 5L of good stuff in a keg that fits in the fridge, takes less space than a couple of six packs and you don’t have all those bottles to clean, sterilise and repeat – boom! Best of all she still fits into the cooler box, and is available with all the attachments to carbonate and pour, at home or when you are out to play. NOTE: These do not come with a tap, however they can be used with and ball lock tap and therefore complement existing kegerator setups. The 3L can be used as a growler without the ball lock cap - perfect for filling up at your favourite tap room or brewery! 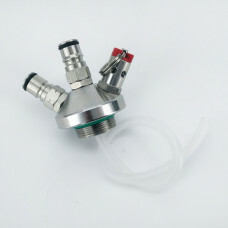 Mini Keg - ball lock tapping head with silicone dip tube designed to fit the Kegland Mini Kegs. The thread on these mini kegs is 1inch 16TPI.